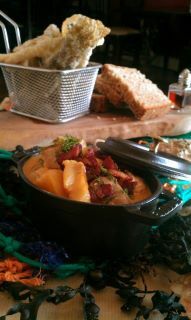 I love classic seafood chowder it’s a great way of showing of all of our local fish that we have on our doorstep. At the Portaferry hotel Gary Bell loves to serve this dish in a very dramatic fashion and bring a little of the seaside to our customers table. Serve on a big board draped with seaweed and netting for two people to share with fresh wheaten bread and crispy fish skin seasoned with salt and vinegar. I know this is quite excessive at home but it works equally as well served in individual bowls with plenty of wheaten or crusty bread. 3 large potatoes cut into 5mm dice. Heat 1tblsp of olive in a large pan, when hot add the mussels and the white wine, cover and bring to the boil, cook for 1min, add the cockles and cover again. Cook over high heat for a further 2-3mins or until all of the cockles and mussels have opened and are cooked through. Place a sieve over a large bowl. Remove the pan from the heat and strain the cockles and mussel. Place them onto a tray and reserve the liquid. Heat the butter in large saucepan and brown the bacon well until it is crisp and golden. Add the onion, cover and sweat for a few minutes over a low heat. Stir in the flour and cook for 1-2 minutes. Add the fish stock and the reserved mussel liquid gradually. Add the milk and potatoes. Season well with salt, pepper and cayenne. Cover and simmer until the potatoes are almost cooked, approximately 5-6 minutes. Cut the fish into small cubes. Add to the pot as soon as the tip of a knife will go through a potato. Simmer gently for 3-4 minutes, stir in the cream and add the shelled mussels and cockles, bring to the boil and when boiling, remove from the heat. Taste, correct the seasoning, sprinkle with freshly chopped parsley, scallions and chives. Serve in a deep dish with plenty of bread and butter.